The Army's new chief of staff said he wants to accelerate by two years a plan to increase the nation's active duty soldiers by 65,000. 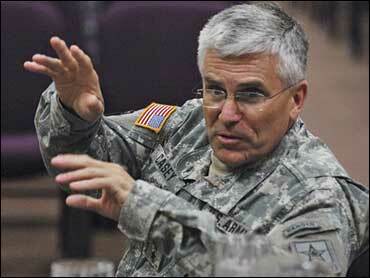 The Army has set 2012 as its target date for a force expansion to 547,000 troops, but Gen. George Casey said he told his staff to have the soldiers ready earlier. "I said that's too long. Go back and tell me what it would take to get it done faster," he said in an interview Saturday with The Associated Press during a stop in Hawaii. Casey became the Army chief of staff on April 12 after serving as the top U.S. commander in Iraq for two-and-a-half years. He visited Hawaii for a few days in a Pacific region tour to talk with soldiers and their families. He next heads to Japan, South Korea and Alaska. Casey said his staff has submitted a proposal for the accelerated timeline but that he has yet to approve the plan. He said the Army was stretched and would remain that way until the additional troops were trained and equipped. Casey told a group of soldiers' spouses that one of his tasks is to try to limit the impact of the strain on soldiers and their families. "We live in a difficult period for the Army because the demand for our forces exceeds the supply," he said. A woman in the group asked Casey if her husband's deployments would stop getting longer. She said they used to last for six months in the 1990s but then started lasting 9 months and 12 months. Two weeks ago, she heard the Army's announcement that deployments would be extended as long as 15 months. Defense Secretary Robert Gates in January said he was recommending to the president that the Army boost its active duty soldiers by 65,000 to 547,000. Casey said about 35,000 of those additional soldiers are already in place. Gates also recommended that the Marine Corps increase its active duty force by 27,000 to 202,000.